Elisabeth Storrs retells the historic story of the tragic girl whose death inspired the men of Rome to rise up against a tyrant king and establish the Roman Republic. Was she a victim or a champion? A pawn in political schemes or the catalyst for rebellion? In this vivid short story, Lucretia’s character is explored to reveal a tender portrait of a young girl misused by men who transforms into a woman with a passion for justice. 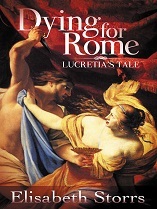 In appreciation for subscribing, I’m offering a FREE copy of Dying for Rome: Lucretia’s Tale, an 80 page short story.